Ever since the Fall, conflict has been an ordinary feature of human interaction, often with devastating results. Fortunately, God's Word equips us with numerous strategies and insights in our stewardship of the differences between us and others. The purpose of this site is to offer those resources to you by means of blogging, podcasting, and more. (4) by telling others about same-mind.net. Articles must be original material on the subject of biblical conflict management written by the person offering the submission. Articles must not exceed 1000 words. Articles must be submitted electronically to rgilmore@same-mind.net . No attachments will be opened. Include your article in the body of the email. Articles cannot be acknowledged or returned. Please Note: A PDF of this manual is available upon request. All we are now proposing to do is to lay hold on His faithfulness Who has called us into this service, and in obedience to His call and reliance on His power to enlarge the sphere of our operations, for the glory of His name Who alone doeth wondrous things. Taylor’s words capture the spirit of God-honoring intentional change. It is change brought on by vision either to begin doing or to expand upon doing the will of God for His Church. As a fellow pastor and Christian leader with more than 32 years of ministry experience, I have become a friend of the kind of intentional change that is based on doing the will of God and that stimulates a ministry’s healthy growth and improves overall ministry effectiveness. This manual is designed to pass along lessons I have learned about the process of implementing change in healthy ways. It outlines certain steps to follow as individuals or groups of people begin their pursuit of what God has in store for them. The manual includes footnoted references throughout and a select bibliography at the end. It also includes graphics, which may be freely copied and pasted into PowerPoint presentations. Finally, reflection questions are also inserted here and there to assist in the assimilation of the material. As you make use of this manual, my prayer is for you to see all that God has for you and your organization to do for His glory. I pray also for you to lay hold on His faithfulness, and to pursue the fulfillment of His will for you and your organization with all of your heart. Church consultant and author, Aubrey Malphurs, represents the life-cycle of a church with a bell curve plotted on a 2-dimensional graph of church attendance and church age (see Figure 1). 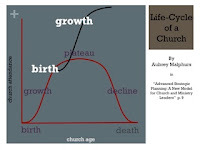 Don’t get hung up on “church attendance” being the primary measure of “church life.” Try to focus in on the phases of the cycle itself: birth, growth, plateau, decline, and death. 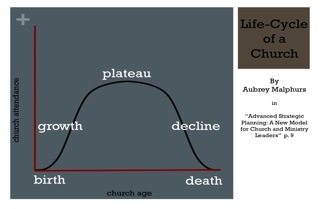 Ask yourself: “Where in this cycle would an objective analysis place my church? Malphurs’ analysis is consistent with my personal experience at the church where I pastor. Several years ago, I noticed we were having to make some kind of major change in church facilities, staffing, or programming about every 1.5 years. The kind of changes I am referring to involve things such as adding or changing pastoral staff (including interns), adding or remodeling facilities, adding or shutting down ministries, adding or shutting down services (e.g. for example, over the years, we have developed a significant Wednesday night set of ministries, and we have stopped having a Sunday evening preaching service; years ago, we started a small group ministry, which we eventually shut down when we finally had the facilities to dive headlong into a thriving Sunday School ministry, not just for kids, but also for adults). Most of the major changes we’ve made at our have resulted in new S-curves of birth and growth. However, in some cases, the major change we introduced involved assisting an existing ministry with decline and death. Sometimes it can be wise strategically to let something die that needs to die, so that something better can be birthed in its place at a later time. What Kind of Change Will Work For You? About now, you may be wondering if this manual is going to advocate a particular type of change; or, for that matter, the specific changes we have made at our church over the years. The answer is “Definitely Not!” No single strategy for ministry works everywhere; however, I do believe certain biblical components must be present in every ministry strategy, regardless of how the superstructure of that strategy is built. In our church, every ministry strategy must somehow involve the biblical teaching on Jesus’ exaltation as the Lord of lords. In other words, each of our ministry strategies functions as a means to exalting the Lord. Reflection question: Which biblical components do you believe should be included in the ministry strategy of your church or Christian organization? 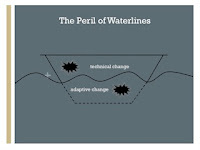 Yet another way to distinguish between technical change and adaptive change is to consider the relative calm or danger presented by one or the other. A good analogy to explain the difference is the waterline on a boat. If you punch a hole in a boat above the waterline, the peril to the boat won’t be that great. However, if you punch a hole in a boat below the waterline, the boat just might sink! Making technical changes is like punching holes in boats above the waterline. 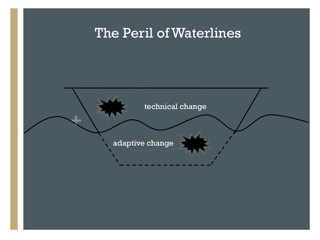 Making adaptive changes is like punching holes in boats below the waterline. The analogy does not involve comparing your church to the boat, and if you punch a hole below the waterline, your church will sink. The analogy involves you understanding that the boat is your ministry. And when you begin punching holes below the waterline in your ministry-boat, you and your ministry are at risk. 4. Seduction – the change agent dialoguing solely with supporters, embracing their affirmations and support while demonizing the “opposition” (shutting out dissent or compromise possibilities). To bring all this home, try substituting “pastor” for “change agent”. We could stay busy for hours, unpacking all the biblical examples of leaders who experienced one or more of these perils: Noah, Moses, Nehemiah, and on the list could go. Of course the greatest example of all is Jesus himself. Jesus confronted the Pharisees with adaptive change after adaptive change. There’s no better example of this than the Sermon on the Mount. Over and over Jesus said, “You have heard it was said long ago…but I say to you!” As a result, Jesus experienced all four of the threats leaders face when they make or even suggest adaptive change. Reflection question: Which types of threats have you faced in the past due to some change or changes you attempted to make? How did you handle the threat? What lessons did you learn from your experience? In the end, no leader (no pastor) can escape every bit of danger posed by the adaptive or transformational changes he is leading his church to make. Nevertheless, it is possible to minimize the danger by learning and utilizing wisely crafted steps toward implementing healthy change. The sixteen steps outlined below are critical elements of the process for implementing healthy change. The key words here are “process” and “healthy”. Anyone can attempt and even succeed in making changes in their organization. Making “healthy” changes, changes that preserve relationships, that preserve the leader and the organization itself, is something entirely different. To succeed with implementing “healthy” changes, pastors and leaders must develop and follow a wisely crafted process. The word “process” indicates among other things that implementing healthy change will take a significant investment of both time and energy. Here are the sixteen steps, each of which is briefly explained. 1. Begin to bathe your ministry and the entire process of implementing change in prayer. Nehemiah is a stellar example of a biblical change agent who utilized prayer extensively as he led the people through the rebuilding of the walls of Jerusalem and through the associated changes the rebuilding had on their lives (see Nehemiah 1:4; 1:5-11; 2:4; 4:4-5; 6:9, and 14). 2. Read several books or journal articles on organizational change and resistance for ideas and perspective on implementing healthy organizational change. You might consider beginning with the books and articles listed in the bibliography. One of the best ways to discover the narrative of your congregation is to ask members to create a historical time line. On several sheets of newsprint taped to the wall, draw a long horizontal line. At the far right end, write the date of the current year. On the far left side, write the date of the founding of the congregation. In between, write key historical events in the life of the church. As persons share, encourage them to tell stories. Ask them to name specific personalities, locations, even weather conditions. Invite them to enter fully into the color and texture of their history. Help participants feel the richness of their heritage and the intrinsic value of their experience. The unfolding of a congregation’s story is a powerful event, identifying many connecting points and precedents for launching future ministry. 4. Understand your congregation as a complex network of systems. Mundey suggests four types of systems that exist in churches and Christian organizations: (1) the political system (who are the influencers? ); (2) the transportation system (how do things get done and communicated? ); (3) the resourcing system (how are people equipped and motivated? ); and (4)the weather system (what factors influence the overall climate of the church?). 5. Dig into the Scriptures for guidance and begin asking God to reveal His will to you and your organization. All ministries are smaller units of God’s larger spiritual presence on earth. They also play roles in a larger spiritual battle being waged right before our eyes. Accordingly, we need to employ prayer; for we cannot expect to fight spiritual battles and win without constant, fervent, and all-encompassing prayer (see Ephesians 6:18-20). Keep in mind, that one of your major aims is to enroll others in sharing God’s vision for your church or ministry. Peter Senge cautions against the dangers of other types of responses to vision, types of responses that function as something less than commitment and enrollment: (1) genuine compliance; (2) formal compliance; (3) grudging compliance; (4) non-compliance; and (5) apathy. Even though compliance may seem like the desirable response, commitment and enrollment call out higher levels of cooperation, creativity, and motivation to turn the vision into reality. 7. Write out a brief vision narrative to describe the desired future of your church or ministry. A vision narrative is a one-page summary of what your organization or ministry looks like and how it will function once your vision is fulfilled. Longer than a simple “vision statement”, a vision narrative briefly tells the story of the desired future you have in mind. Of course, it will be necessary soon to begin enrolling others in the vision for your church or ministry. This means as you write the narrative you must remain flexible, understanding that God may have a role for others to play in helping you to shape the vision He has in mind for your church or ministry. 8. Identify and rank the current values of your church or organization in the order of their importance. Identify which values to be added, which need to be changed, and which need to be moved around in the hierarchy in order for your vision to be fulfilled. One way to discover the values of your organization and ministry and their hierarchy of importance is to analyze what you are currently doing from the perspective of what values or what hierarchy of values that communicates. Another is to assemble a collection of the top five or ten stories that belong to your organization’s culture, analyzing them in a similar fashion. 10. Prayerfully ask God to help you to select a vision team with key players from your church or ministry to help you with moving forward. This team does not necessarily have to be composed of people who have historically been in agreement with you. However, they should be people who are spiritual and who are able to interact with you and others as a team with the mission of developing a vision for implementing healthy change in your organization. Reflection question: What is the profile of a person you believe would be an ideal member of your team? Why are the elements of the profile important to you? What is the profile of a person you would not want on your team? Describe how someone might help your team, even if you personally do not “click” with him or her? 11. Repeat Steps 1-9 and then skip to step 12. As you proceed, keep on reminding the team to cultivate the same flexibility and openness to the creative input of others that you are modeling to them in reference to your ideas and preconceptions. 12. Solicit the ideas of others in your congregation or organization at large. Provide information for people to guide their creativity; using, for example, attendance demographics and statistics, community demographics, community needs, congregational needs. Craft a report to your constituency that reveals your and your team’s findings from Step 3. Ask people for “their” solutions to certain ministry challenges or for new expressions of God-given organization values. 13. Identify potential sources of resistance and the potential losses that may occur if the change you are proposing is enacted. Nehemiah anticipated the resistance of Tobiah and Sanballat, since he knew they had something to lose if he went forward with the plan to rebuild the walls of Jerusalem. He knew the rebuilding of the walls would dramatically shrink their political playgrounds. Therefore, he monitored them to stay aware of the shape their resistance was taking. Mundey advises on the loss that even healthy change can represent to some people: “When you change from one locale to another, you unpack boxes; when you transition from one locale to another, you unpack memories, emotions, dreams, self-perceptions, relationships, and even faith. Transition touches all aspects of our personhood; it challenges us to stretch from a familiar reality to a fresh, but frightening context.” An awareness of the potential losses will equip you not only to anticipate resistance, but also to reduce it with strategies of biblical same-mindedness. 14. Carefully invite participation and enrollment in the plan for change as it currently stands. When it is time for the larger group to make a formal decision about going forward. Mundey advises the following: (1) Never introduce a new idea and vote on it in the same meeting; (2) Identify clearly the avenues for additional information and input; (3) If people are opposed, meet with them individually…[to] listen carefully to objections, reviewing the benefits of the proposed change as needed; (4) Don’t position yourself for a negative vote. If you sense that the tide is against you, do a reassessment; (5) When you sense that people are “with you,” bring them together and move toward a positive vote. 15. Launch the changes well. It is advisable to over-communicate what is happening and when. Use multiple channels to connect with people: announcements, mailings, emails, web pages, blogs, skits, sermons, small group meetings, large group meetings. Involve your planning team in the communication. Measure your communication success when people are clear with what the vision and changes are based on their communication with your team, not just on their communication with you. Reflection question: What methods do you normally use to communicate with your organization? Randomly choose three people from your organization and ask them to assess your organization’s communication effectiveness. Do you agree or disagree with their assessment? 16. Monitor progress with intention and celebrate. Establish mileposts for evaluating your progress and make any adjustments that are necessary to ensure success. The adjustments might involve communication practices or even changes in the implementation strategy itself. When you observe progress and success, even if it seems small in comparison to the overall plan, celebrate what God is doing in order to promote momentum. Do so with integrity, so as to not undermine future successes when they actually do occur. It will be important to read through the sixteen steps more than once to familiarize yourself with them. You may discover it will be necessary to return to one or two of them as you move along in the process of implementing healthy change in your organization or ministry. Finally, in your reading and subsequent time of leading your organization or ministry through change, you may also believe additional steps are needed to ensure the “healthiness” of what you are doing. As stated near the beginning, the critical thing is to lay hold on God’s faithfulness, and to pursue the fulfillment of His will for you and your organization with all of your heart. Ford, Kevin. “When Simple Church Isn’t Simple.” A lecture given at a pastor’s lunch sponsored by Aspen Group, October 16, 2008, Fishers, IN. Gilmore, Randal. Where Do We Go From Here: The Path to Biblically Resolving Conflict. Fishers, IN: EXALT Publications, 2007. Heifetz, Ronald A., and Martin Linsky. Leadership on the Line: Staying Alive Through the Dangers of Leading. Boston, Mass: Harvard Business School Press, 2002. Hobgood, William Chris. Welcoming Resistance. Herndon, VA: The Alban Institute, 2001. Malphurs, Aubrey. Advanced Strategic Planning: A New Model for Church and Ministry Leaders. Grand Rapids: Baker Books, 2005. Malphurs, Aubrey. Developing a Vision for Ministry in the 21st Century. Grand Rapids: Baker Book House, 1999. Mundey, Paul. Unlocking Church Doors: Ten Keys to Positive Change. Leadership insight series. Nashville: Abingdon Press, 1997. Senge, Peter M. The Fifth Discipline: The Art & Practice of the Learning Organization. Doubleday, 2006. Aubrey Malphurs, Advanced Strategic Planning: A New Model for Church and Ministry Leaders (Grand Rapids, MI: Baker Books, 2005), 9. Ronald Heifetz and Marty Linsky, Leadership on the Line: Staying Alive Through the Dangers of Leading (Boston, MA: Harvard Business School Press, 2002). Paul Mundey, Unlocking Church Doors: Ten Keys to Positive Change (Nashville, TN: Abingdon, 1997), 48. Aubrey Malphurs, Developing a Vision for Ministry in the 21st Century (Grand Rapids, MI: Baker Books, 1999), 41. Peter M Senge, "The Fifth Discipline: The Art & Practice of the Learning Organization," (Doubleday) 2006, 204. 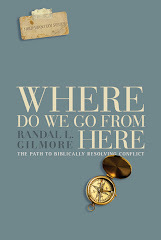 Randal Gilmore, Where Do We Go From Here: The Path To Biblically Resolving Conflict (Fishers, IN: Exalt Publications, 2007), 1-62. This is very good advice and insight. Thanks for putting it online for the rest of us to learn from! Where Do We Go From Here? Now Available on Smashwords! Now you can download an ebook copy of "Where Do We Go From Here?" for only $1.99 in your favorite digital reader format. Click here.